UCAT Masterclass. The Easiest Way to Prepare for UCAT. Stress-Free! Ace your UCAT Exam with UCAT subject matter experts. I don’t know what to expect in UCAT. I heard that you can’t really study for UCAT. I worry that I won’t be able to get into medicine because of UCAT. Everything you need in one place for UCAT success. 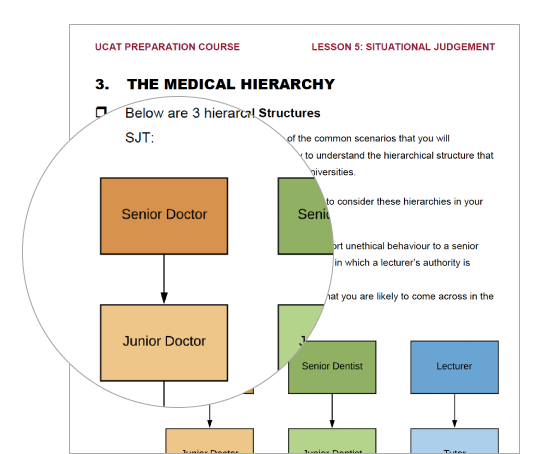 From engaging theory lessons, effective exam strategies and techniques and the latest UCAT resources – it’s all here at UCAT MasterclassTM. We’ll equip you with the logical, analytical and critical thinking skills to solve even the trickiest questions easily and quickly. Want to get into Medicine in 2020? Read our Beginners Guide to UCAT for everything you need to know about the UCAT exam! Practise with the real thing! 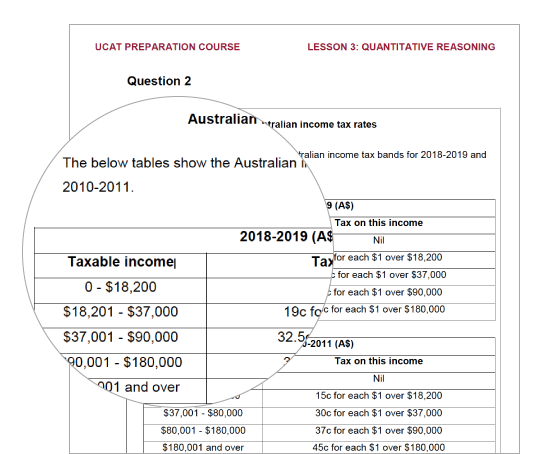 Take a sneak peak at Australia's first UCAT Exam Simulator. The real UCAT exam is a 2-hour computer based test with 233 multiple choice questions. Get real exam experience with Matrix UCAT Exam Simulator. Gain the right techniques with our step-by-step approach to building your logical thinking abilities, critical thinking skills and moral and ethical standards. Develop your ability to speed-read and understand passages of text. Equipped with the essential comprehension skills, you’ll be able to determine whether specific conclusions can be drawn from the information presented. Learn to interpret complex textual or numerical information to make logical judgments or conclusions. Equipped with the process for analysing 6 different types of Decision Making questions, you’ll be able to solve any unseen questions in a timely manner. Watch our Decision Making Expert in action. Learn to use your mental maths to perform numerical calculations quickly and accurately. Equipped with techniques to solve numerical problems, you’ll be able to perform calculations accurately under time pressure. Watch our Quantitative Reasoning Expert in action. Learn to map your thought process. Improve your ability to infer relationships from information. Equipped with over 15 techniques to quickly identify complex patterns amongst shapes, you’ll be able to solve each question under 15 seconds. Watch our Abstract Reasoning Expert in action. Learn to identify critical moral and ethical concerns in real world medical and educational scenarios. Equipped with framework for responding to situations involving moral and ethical concerns, you’ll be able to make better situational judgement. Avoid surprises on test day. Test yourself with 3 full mock exams under timed conditions on the Matrix UCAT Exam Simulator powered by Learnable. 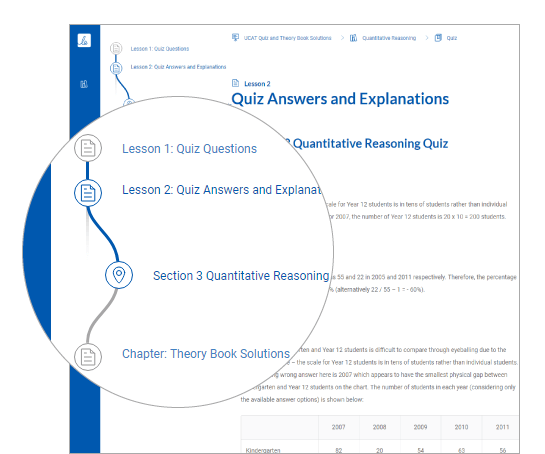 Review your answers and learn from detailed explanations for each question in quizzes and Matrix Theorybook questions. Gain problem solving, critical thinking and people skills required for UCAT success. Learn to read and think carefully about information presented in passages and determine whether specific conclusions can be drawn from the information presented. Train your ability to speed read passages of text and interpret information quickly. Identify the 2 types of questions in the Verbal Reasoning subtest and develop targeted strategies for each question type. 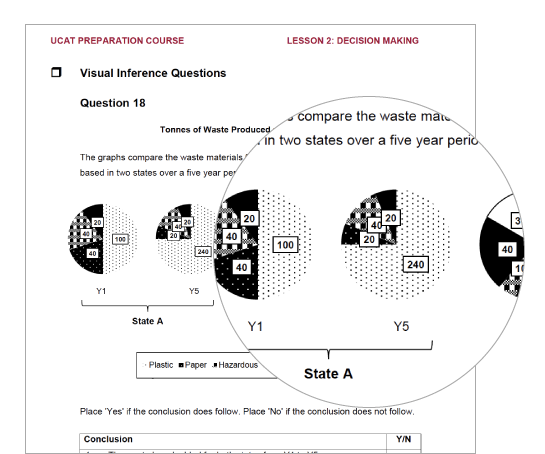 Assess your UCAT readiness with an in-class quiz that mirrors the real UCAT exam. Learn to apply logic to reach a decision or conclusion, evaluate arguments and analyse statistical information. Develop a process of logical thinking that allows you to solve problems quickly and avoid common pitfalls. Identify the 6 types of questions in the Decision Making subtest and develop targeted strategies for each question type. Learn to use numerical skills to solve problems. Train your mental maths and develop arithmetic techniques to perform calculations quickly. Identify the 7 key skills tested in the Quantitative Reasoning subtest and develop targeted strategies for each. Learn to identify patterns amongst abstract shapes where irrelevant and distracting material may lead to incorrect conclusions. Develop the ability to quickly recognise the most common types of patterns in the Abstract Reasoning subtest. 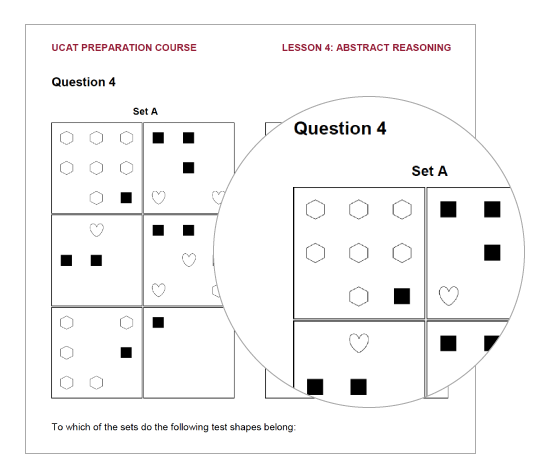 Identify the 4 types of questions in the Abstract Reasoning subtest and develop targeted strategies for each question type. Learn to understand real world situations and to identify critical factors and appropriate behaviour in dealing with them. 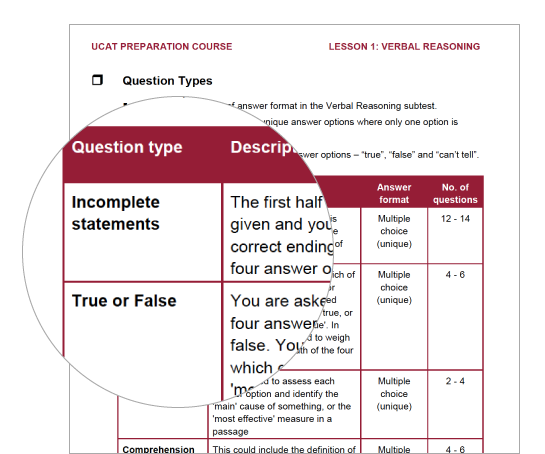 Create a framework that outlines the key responses the UCAT examiners are looking for. 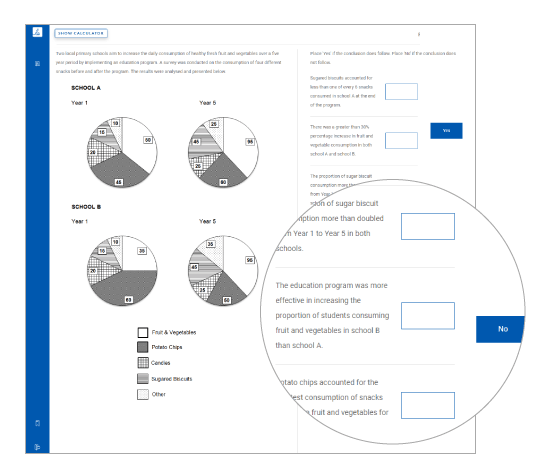 Identify the 5 types of scenarios in the Situational Judgement subtest and develop targeted strategies for each scenario type. Vast teaching experience with insights into exam techniques and an ability to explain concepts clearly. A complete set of resources tailored for UCAT success including a guided theory book that has all the skills and techniques that you need..
2 or 5 day engaging lessons where you will cover all the essential UCAT techniques thoroughly. Two-hour computer-based UCAT tests to simulate the real UCAT exam. Track your performance against your peers. Use actionable insights to identify your areas of improvement. Not a lecture style with hundreds of students. Our UCAT classes have a maximum class size of 18 students. Notify me of new UCAT Masterclass sessions! Leave us your details and we’ll email you when a new UCAT MasterclassTM session opens. Tell us your postcode so we can offer a session near you. Selina specialises in the Decision Making and Quantitative Reasoning Subtests. She has a Bachelor of Commerce and Law from UNSW. She has worked at Goldman Sachs in investment banking and has been teaching Maths for over 6 years. She is a co-author of the mathematics and UCAT course materials. Alex specialises in the Verbal Reasoning and Abstract Reasoning Subtests. He is the Head of Science and has over ten years experience teaching at Matrix. He is the co-author of the Matrix Science program, course materials and assessments. He has been writing and teaching UMAT and UCAT courses for over 2 years. Ashley specialises in the Decision Making and Quantitative Reasoning Subtests. She studied a Bachelor of Commerce and MBA at UNSW. She has been writing and teaching UMAT and UCAT courses for over 6 years. She is the CEO of Matrix Education. Jason specialises in the Abstract Reasoning and Situational Judgement Subtests. He studied a Bachelor of Advanced Science and a Doctor of Medicine (MD) program at the University of Sydney. Jason has been teaching and tutoring at Matrix for since 2013 and is a contributing author to the Matrix Biology and Junior Science resources. Sophie specialises in the Verbal Reasoning and Situational Judgement Subtests. She has graduated from the University of Sydney with a Bachelor of Arts and has been teaching English at Matrix for over 6 years. She has been writing and teaching UMAT and UCAT courses for over 2 years.